Could this be your next meal? 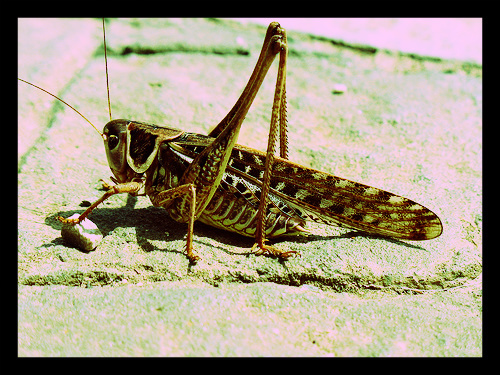 It may have to be; grasshoppers are the food of the future. Overpopulation is a real concern for the planet and for “quality of life standards” for every person on the planet. It is estimated that the global population will reach 8 to 10 billion in the next few decades, and with this a whole new way of life will have to be adopted to meet our needs. A major transition will have to occur in regards to the food we eat and how food is grown, managed and distributed. Current habits will not be able to keep pace with growing demands. One thing that will have to be downsized is the cattle industry. It is simply not sustainable and efficient for feeding beef to more and more people, and its environmental effects will become even more of a liability. The solution? Farming and harvesting insects. It takes very little water and transport fuel compared to livestock, grains and even vegetables. It is also far more efficient than raising cattle. One hundred pounds of feed produces 10 pounds of beef. The same amount of feed would produce more than four times that amount in crickets. They are high in protein, iron and calcium, making them a logical food choice; it is already utilized in many regions of the world. What Would an HIV Cure Mean for the World’s Poor? Aid to Haiti: What Lessons Can We Learn?